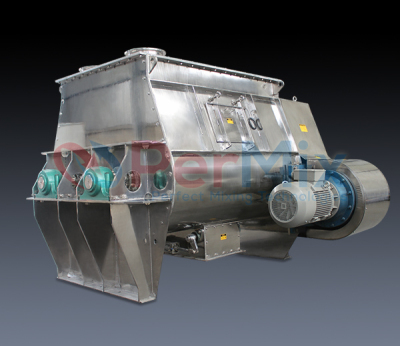 The PerMix PFB series Twin Paddle Mixer is a fast mixer with high efficiency, which can also be known as Fluidizing Mixer, Fluidized Zone Mixer, Non-gravity Mixer or Zero-gravity Mixer. 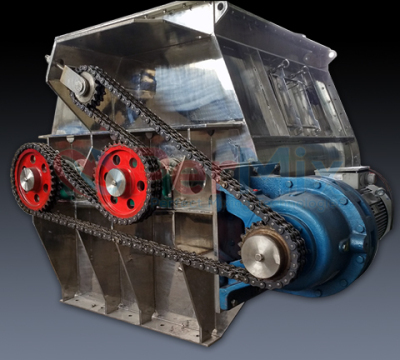 The paddle mixer is capable of preparing a homogeneous mixture despite of particle size, shape and density, and is able to achieve fast, high capacity, thorough, precision mixing of either dry bulk solids or solid with liquid. The PerMix PFB series Twin Paddle Mixer consists of paddles with special angles that are mounted on twin shafts in a ‘W’ shaped trough. During operation, the two shafts are rotating in opposite direction. The paddles sweep the entire bottom of both troughs, and materials are lifted floating between the two shafts (as zero-gravity zone) by the centrifugal force generated by the paddles. At this weightless zone, mixing of materials of different density is easy and fast because material particle can move freely and randomly, regardless of particle size and density. This brings a rapid and highly homogenous mixing. 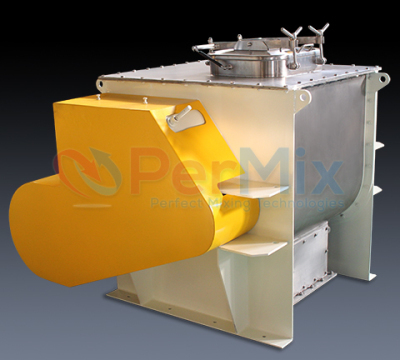 Although the PerMix PFB series Twin-shaft Paddle Mixer is featured by its gentle mixing at the weightless zone, it can also achieve rough mixings with additional PerMix Pin Milling Bars to be installed on the top of the paddles. 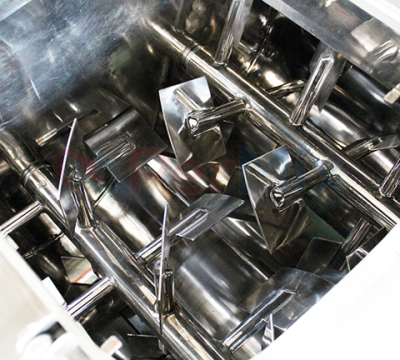 The PerMix Pin Milling Bars are two rapidly rotating bars with pins and a stationary shroud, which introduce high shear force onto the materials during mixing to break soft lumps and agglomerates. In this case, a fill level of 140% of normal capacity is required.